What can we say about Frankenjura which is not said yet? Everyone knows, that this is one of best climbing areas in the world. The first 9a was climbed here back in the days of Wolfgang Güllich. Also not to forget the good Bavarian (or better Frankish) food and beer. But is it possible to cycle and climb in Frankenjura at the same time? It is a huge area and going from one place to the other might take a bit with the bike, especially as it is hilly. However, choosing a well situated camp site is the key for a short approach to the climbing spot. 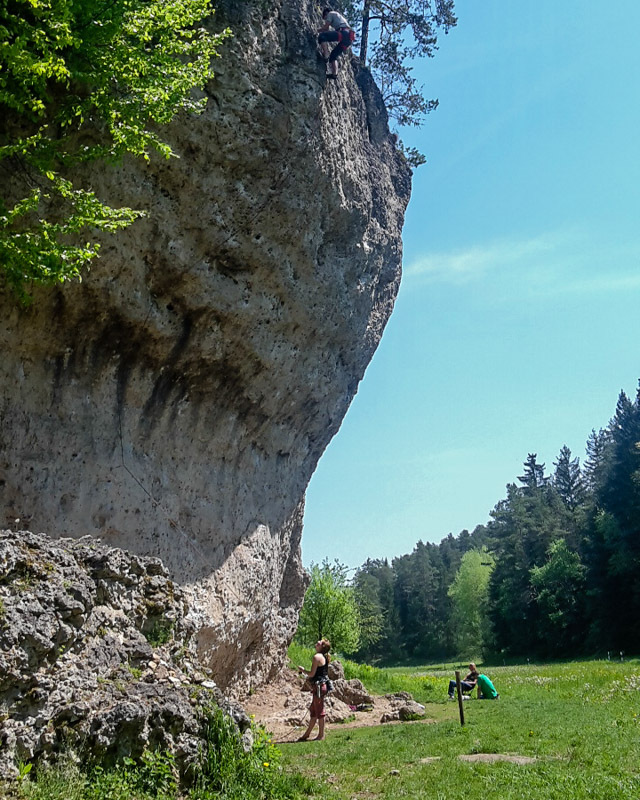 More about our cycling and climbing adventure in Frankenjura can be found in the blog post about Germany. Not just climbing is great in Frankenjura, also cycling is an enjoyment. 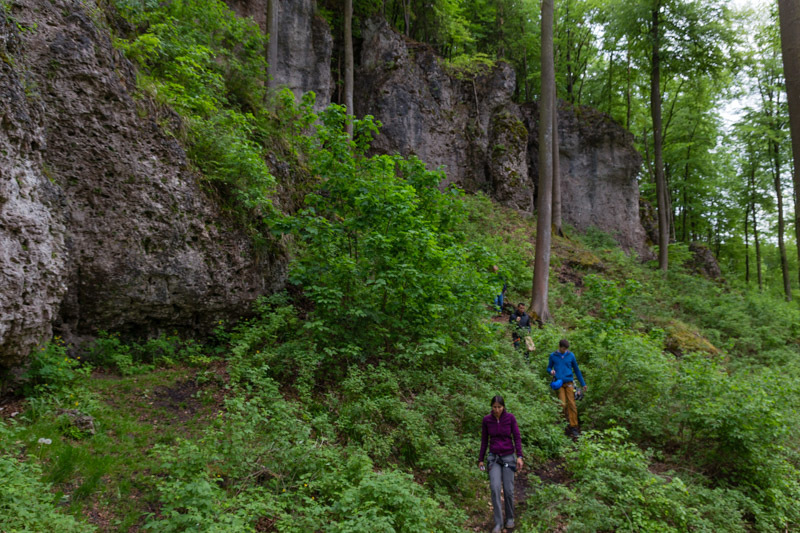 Rock and routes: In German the type of rock is called ‘Muschelkalk’, which means shell limestone and it is just made for climbing. Very solid rock with tons of pockets and features, which can be sharp. Some classic routes are already polished. The routes are usually rather short and powerful. Climbing area and environment: Frankenjura is a huge area spanning about 100 km in each direction. Within this area small climbing crags are everywhere, especially along the valleys. Each crag has its own atmosphere, ranging from hidden crags in the forest to open crags overlooking beautiful valleys. On top of that the hilly landscape with lots of small villages, castles and churches is a great hiking or cycling area. Guide book and information: As the area is so big, two guide books exist, called ‘Kletterführer Frankenjura Band 1’ and ‘Band 2’ by Sebastian Schwertner. It provides a clear structure, good descriptions to find the crags and nicely drawn topos. With over 10.000 routes in all grades to choose, everybody finds a perfect route! Rain can be a problem, which can occur all year round. However, the rock dries rather quickly, especially in the sun. Each climbing crag has its own ‘micro climate’. This means it is possible to climb during the summer heat in a shady forest and in the winter on a sunny wall. Shady climbing area in Frankenjura in the middle of a forest. Accommodation: Within the Frankenjura area there are plenty campsites or guest houses. Choosing the right camp site for the right climbing crag is key to avoid a long approach. We stayed at the famous Oma Eichler campsite (www.gasthof-eichler.de), which gave us easy access by bicycle to all climbing crags along the Trubach Tal. Access to food: From the campsite Oma Eichler, food is rather difficult to get as the next larger super market is about 15 km away, so plan well. Simple stuff and excellent cake is available at the campsite. Access to water: Water access at the camp site, but usually not at the climbing crag. 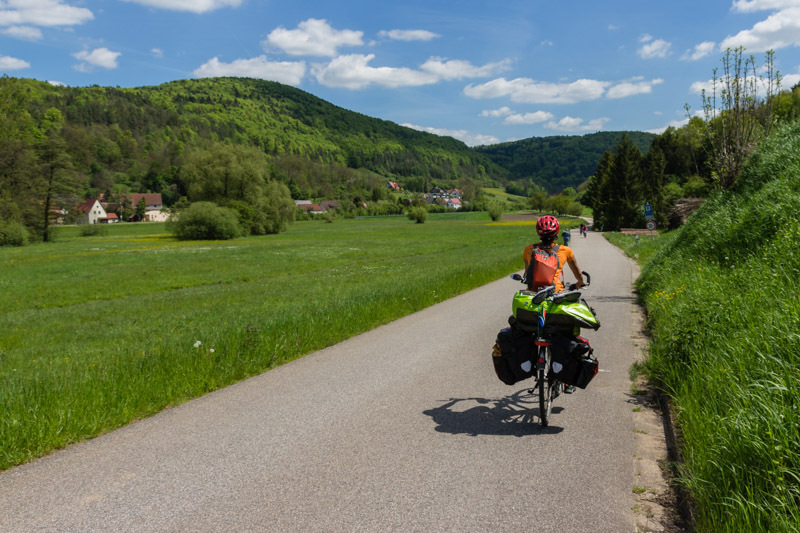 Access by bike: Frankenjura is very hilly and it is important to plan well, where to stay, climb and get food. All three points are possible to combine, but certain compromises have to be made. The famous Weißenstein in Frankenjura.